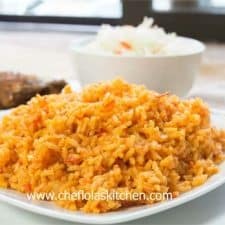 The Party style Basmati Jollof Rice – Jollof Rice is one of our favorite party food in Nigeria, hardly will you go to any party and not find this delicious meal. I know a number of people might not want to try the basmati Jollof Rice because of the Aroma that comes with the Rice but don’t worry, the Jollof sauce and spices will cover it up. I thought that was going to be the case for a long time and I did not bother trying out the Basmati Jollof Rice recipe until recently when I tried, I was pleasantly surprised and my little tasters also approved it. When cooking Jollof Rice in general, it is advisable to select the best variety of Peppers for this recipe in order to get that authentic party taste. I will suggest going with Pimento pepper (subst. Tatashe) rather than red bell peppers, it helps to bring out the real flavour as well as that bright red color bright red color. If you have a pre-made sauce, you can use it as well but try to substitute Red Bell peppers with Pimento Peppers it tastes better in Jollof Rice. Have you seen my Oven baked Jollof Rice recipe? Check it out. Jollof Rice can be paired with Moin moin, salad, Chicken or Beef. The Party style Basmati Jollof Rice - Jollof Rice is one of our favorite party food in Nigeria, hardly will you go to any party and not find this delicious meal. Blend the peppers and Tomato paste together and set it aside. Heat up the cooking Oil in the Pot and add the bay leaves and Ginger and leave it for about a minute or two so that the aroma of these ingredients can get infused inside the Oil. Add the blended pepper and leave it to cook covered for about 10 to 15 minutes - we want it reduced to about half of its original size. Season the Sauce with the Seasoning cubes, Curry powder, thyme, and Salt to taste if necessary. Pour in the Chicken stock, mix well and leave it to come to a rolling boil. Rinse the Rice and add it to the boiling sauce, mix it together and cover it up with a tight-fitting lid. Cover the pot with a tight-fitting lid, if you don't trust your lid, simply cover the pot with aluminum foil, around the rim of the pot so that no steam escapes. (Check notes above). Start by cooking on a high heat, then reduce the heat to a medium-low once the Rice starts boiling and leave the Rice to cook for 15 minutes (undisturbed). Turn off the heat and let it steam for another 5 minutes. Uncover the Rice, fluff with a fork and serve hot! Not fully blending the peppers; not really course but about 85 to 90% done gives it a more party look. It's also very important to firmly cover the Rice while it's cooking; if you don't have a tight-fitting lid to cover your pot, simply cover it up first with a foil paper before placing the Pot lid over it. Slowly caramelize your Onion and add the Bay leaves and Garlic for about a minute or 2 before adding the blended Peppers - You will like the outcome. To help reduce the amount of Rice that will get burnt, start by cooking on a high heat, then reduce the heat to a medium-low once the Rice starts boiling. Basmati Rice cooks fast, so add a little water at a time so that you will not end up with a soggy Rice. Don't forget to keep an eye on the Jollof Rice, you might need to add more water during the during the cooking process. Jollof Rice is one of our favorite party food in Nigeria, hardly will you go to any party and not find this delicious meal. Add the blended pepper and leave it to cook covered for about 10 to 15 minutes – we want it reduced to about half of it’s original size. Rinse the Rice and add it to the boiling sauce, mix it together and cover it up with a tight fitting lid (Check notes above). Start by cooking on a high heat, then reduce the heat to a medium low once the Rice starts boiling and leave it to cook for an extra 10 to 15 minutes. Once the Rice is done, mix it together thoroughly to distribute the seasoning. « How to make better Moin Moin (Moi Moi) – Why is my Moin Moin Mushy? Thank you for the feedback Khasomi, I’m glad the recipe worked well for you. God bless you too!